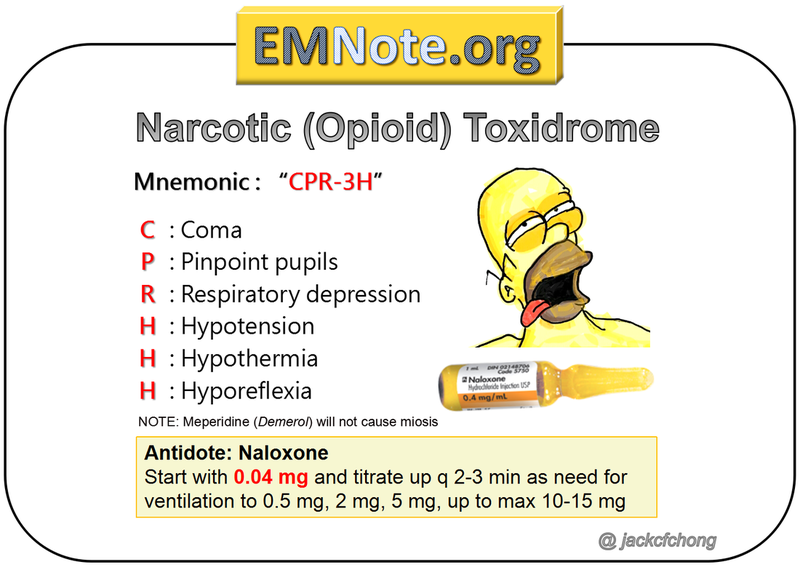 Naloxone, if given in single large-dose bolus, may precipitate opioid withdrawal in opioid-dependent patients causing patient distress and life threatening complications: seizures, non-cardiogenic pulmonary edema, and cardiovascular collapse. Start naloxone with small doses, i.e. 0.04 mg, and not the standard dose of 0.4 mg IV/IM. The use of copious amounts of naloxone can precipitate opioid withdrawal. Precipitated opioid withdrawal to an opioid-dependent person does not only cause patient distress and complicate care, but it can be life threatening. Patients with precipitated opioid withdrawal (unlike regular opioid withdrawal) are at risk of seizures and arrhythmias. The often referenced ‘standard dose’ and the dose usually given by EMS is 0.4 mg via the IV or IM route. Although this ‘standard dose’ will reverse opioid-induced respiratory depressant effects in non-opioid-dependent patients, it can precipitate withdrawal in opioid-dependent persons. Life-threatening complications like tonic-clonic seizure, and significant hypotension have occurred with IV/IM doses of 0.2 mg – 1.2 mg. Although severe life-threatening reactions after naloxone administration are relatively rare, it usually occurs when the ‘standard’ naloxone dose of 0.4mg IV/IM is given. Naloxone can be lifesaving. However, given the high prevalence of opioid addiction and the rare but potentially dangerous complication of precipitated opioid withdrawal, the use of initial small escalating doses of naloxone can avoid the development of precipitated opioid withdrawal. An appropriate strategy is to start with 0.04 mg and titrate up every 2-3 minutes as needed for ventilation to 0.5 mg, 2 mg, 5 mg, up to a maximum of 10-15 mg.